Inspiring young string players along a journey of musical discovery fuelled by challenging repertoire, excellent tuition and outstanding performance opportunities. 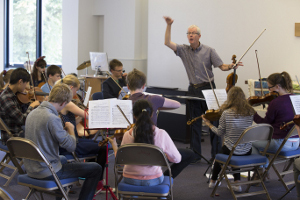 Directed by distinguished violinist and conductor Richard Howarth, the group rehearse on Sunday afternoons (approximately every 3 weeks) throughout the year, performing an average of 4 concerts per season in addition to their annual concert tour which is a highlight for everyone! As well as offering specialist string tuition within a wide-ranging repertoire, the group offers opportunities for playing in smaller groups and for solo performance. Auditions take place by arrangement. Please call the office if you are interested in auditioning on 0115 958 9312 or email us.